I've never done anything the easy way in my life. Why should I now? My writing path has been strewn with rocks at times, but I've persevered and I'm still writing. I look at my milestones as the decisions I've made and the paths I've taken over the years. The rocks have been the obstacles. I rejected the career in science my high school counselors had laid out for me. I got married right out of high school. Six years later I started college as a freshman and finished with a master's degree in English while married, raising children, and running a household. I give thanks to my saint of a mother who took care of my kids. While teaching English, I made a momentous discovery. It came about strangely. I was thumbing through a copy of McCall's magazine and came across a short story by Barbara Robinson. I remember having a sinking feeling. She was writing under my name. How could I use that name? Mind you, I'd never written a word of fiction at that point, but I made the decision that day that when I was published, I'd publish under my full name: Barbara Rae Robinson. I started writing my first novel the summer before I quit teaching. I sold the fourth book I wrote to Harlequin in 1992. 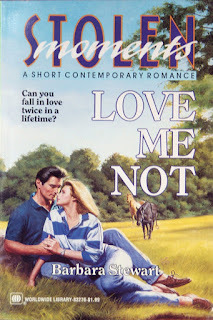 Love Me Not, by Barbara Stewart, was published in March, 1994. Harlequin insisted on pseudonyms back then. By the time the book was published, I was so sick that I couldn't finish writing another book for over 17 years. A big rock in my path. The next three books I wrote were rejected. The last rejection, from a Harlequin editor, called my writing old fashioned. 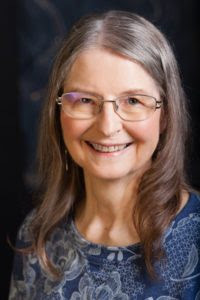 Margie Lawson, at a Rose City Romance Writers workshop, showed me what the problem was, my stilted language. My English teacher voice was not suited to writing romantic suspense. To fix that problem, I took online classes from Margie Lawson and Rhay Christou. And even traveled to Margie's mountain for an immersion class. I learned a lot. And I'm still learning. I have since written four more books that are in various stages of editing. I'm writing a romantic suspense series set in Portland, Oregon, featuring a PI agency and the people who work for that agency. My next goal is to indie publish the first three books in the spring. I'll be getting covers made soon and will upload them to my website: www.barbararaerobinson.com. Blurbs for the three books are already on the website and a cover for the first book that will be replaced. I'm still discovering my path. And I'm joyfully watching where it will lead me. Barbara Rae Robinson lives in the country southwest of Portland, Oregon, with her high school sweetheart, who is still her husband. She spends her mornings writing and the rest of the day living. The rocks now have morphed into pebbles. And the path still awaits. Barb, your ability to persevere, to persist, to being your best and doing what is needed to move forward are qualities I've always admired in you. So glad you found a way to take care of your health problems so you can write. 2018 is a great year to be an indie author! Thanks, Judith. Perseverance has been a watchword for me for many years. I refuse to quit. And I see that same quality in you. May we both be successful in 2018! Great post, Barbara! You have over come a lot to get where you are now. I'm so glad you're only facing pebbles now, and not boulders. I can't wait to read the new series. Great post, Barb. I had a wall poster once: Nothing takes the place of persistence! Thanks, Diana. I hope you won't have to wait too long for the books. But I do need to work faster, somehow. Thanks, Sue. I think I had that poster too, back when I was teaching. I had a collection of them I rotated for the kids. I look forward to the day when I can read your next book, Grandma! Dust away those pebbles and let your dream take off. I didn't know you had a blog, Christie! I love that quote. And I am working on my books. Three will be published this year and maybe a fourth. I'm editing now. Wow! 17 years is a long time to hold onto that dream. I've watched you come out of the fog of that illness and it's amazing the energy you have now compared to then. I'm truly excited to see those books. I know you've been laboring away and doing the smart thing by waiting until you can release them all in a short period of time. I haven’t posted on the blog in a very long time but yes, I do have one. I was trying to write, Maggie. But it was very frustrating. I did read a lot of craft books and took some online classes, but finishing a book was out of the question. I couldn't hold a story in my head and see its shape. I simply haven't finished enough books. The book I finished in December was number 11. I'll keep writing as long as I'm able to. I'm slowly improving my writing skills. Book one had too much old stuff in it. It will be a better book when I finish this round of edits.